Devansh is a sweet, inquisitive five-year-old boy who started speech and language treatment at the San Jose Childhood Language Disorders Clinic because his parents were concerned that he was not communicating. 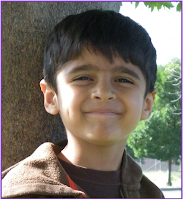 Devansh was diagnosed with a mild-to-moderate expressive and receptive language disorder and a moderate stuttering disorder. Since treatment began Devansh has worked with his clinicians to increase his understanding of language as well as his sentence formulation skills and expressive grammar. During the past five months, Devansh’s treatment has focused on managing his stuttering. He has made excellent progress with his language and continues to make significant gains to decrease his stuttering. Therapy for a child who stutters focuses on helping the child to decrease the number of stuttering behaviors with fluency modification techniques. Equally important in any stuttering therapy program is parent education and working with any prominent caregiver in the child’s life, such as a teacher, to modify the child’s environment in order to achieve the best fluency possible. Another area of importance is focusing on the child’s attitudes and emotions related to their stuttering behavior. When a person who stutters tries to hide their stuttering because they are ashamed of it, this often makes the stuttering worse. Dealing with the stuttering in an open and non-threatening manner helps decrease the tension and in many cases can improve fluency. While Devansh’s family’s experience at the clinic has been rewarding, it has also been rewarding for the clinician’s to see his rapid speech and language growth. He continues to be a pleasure to work with and we look forward to continuing to help Devansh.